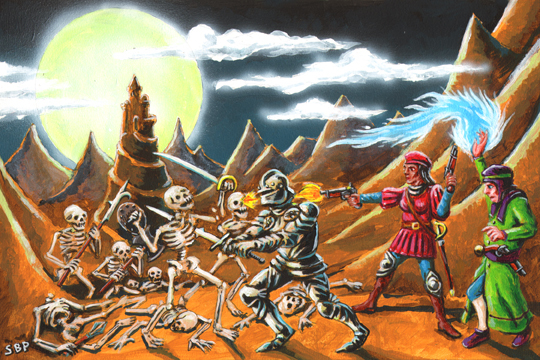 Stephan Poag is my favourite OSR illustrator. I contacted him, asked if he’d like to draw a cover for AFG, details were supplied, then he quickly produced an early sketch, feedback was exchanged and acted on. There’s something about purchasing original art for your game that makes it more real: probably the fact that your pet-project starts to have a material cost, I’m not sure. Working with Stephan has been a pleasure and I hope to do more of the same in the future. Oh, I almost forgot: AFG will be available soon in two formats: digital and print+digital bundle. The Digital format will be 4.50£ and will give you early access not only to the PDF of the final version and the early versions, but also to the LaTeX source files in case you want to annotate or modify it. Yes, you get the source files. And on top a 4.50£ discount on the Print+Digital version, so when you decide to upgrade you will pay only the difference. The Print+Digital bundle details are yet to be perfectly finalized, but will set you off 12£ + s/h for a softcover version of the final release of AFG, an A4 64-pages staple-bound book with colour cover and b/w interiors. did you write a latex package? I have a rough rules class that I have worked on a little, I’d love to hear your approach. No package or other elaborate stuff. I just used the book document type and faffed a while with margins and other parameters: I will build a cls for it but at the moment I need to finalize the last part of the content, which is much more important as the layout is simple and functional, therefore good enough. It’s most certainly a no-frills approach but I’m always up for advice!